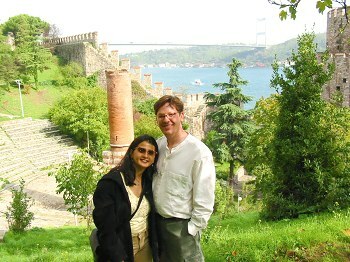 A FEW THOUGHTS ABOUT ISTANBUL: When we chose Istanbul, Turkey for our honeymoon we weren't quite sure what to expect. We hoped it would be a memorable place but we were really knocked out by the city. Staying in the Sultanahmet quarter of Istanbul we were actually in Europe and stunned by our proximity to the Blue Mosque, Hagia Sophia and Topkapi Palace. We really loved our deluxe room at Sultanahmet Palace Hotel with a sea view and balcony. We felt at times like we were in Greece or Bavarian Germany. It was remarkable. It is truly an amazing city with a warm and generous people, who often made a point of the peaceful coexistence of faiths in Turkey. Directly across from our hotel -- in the 150 meters between us and the Blue Mosque -- was a small street for merchants. We met a carpet merchant there that told us he feared Osama Bin Laden might strike the city, that there might be bombings. How prophetic that sounds now. We tried to ally his fears, thinking it would never come to pass. Now, looking through our pictures here, first of the mosque and then of the Spice Market, Princess Island, the Grand Bazaar, a seaside fortress, the Bosphorus, Hagia and Topkapi, our hearts go out to a city we truly felt fortunate enough to visit. It was eerie to see streets we knew marked in this way. What can you say? Get well Istanbul.